The history of the Seward Arts Council reflects the three main forces in Seward's vibrant, grass-roots arts community: Port City Players, the Seward Music and Arts Festival, and the Seward Mural Society. Back in 1958, a group of local thespians got together to create the Port City Players, and have continued to keep our town entertained with a range of productions ever since. The group has even performed abroad. Then a local coffee shop owner had dreams of expanding the town talent show, and in 1995 the Seward Music and Arts Festival was born. Attendance at this annual, all volunteer run, event has swelled to more than 3,000 people. In 1998, the Seward Mural Society was formed because a local artist wanted to paint big. Ten years later, Seward earned the title "Mural Capital of Alaska" with over twenty murals enlivening our public spaces. Through the years, each organization continued to evolve and grow. 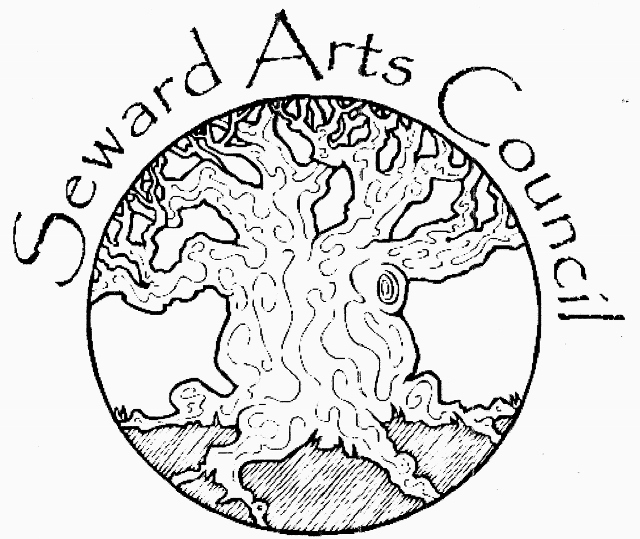 In 2007, the groups decided it was time to place all of the creative talents under a single umbrella, and the Seward Arts Council was born. Theater, festivals, murals- that's not all!!!! The Seward Arts Council also hosts First Friday art gallery walks, seasonal music concert series, and workshops. Our annual fall membership drive is a blast, and many local students have benefited from our annual arts scholarships. If you're looking for a place to get involved with the arts, you've found it! Sitka Fine Arts Camp scholarship TBD. Coming Soon! Download Summer Scholarship Form here -- available to K-8 students. Deadline for application is [TBA]. $500 to high school senior who is pursuing art. Forms available at the high school, and deadline is May 1st. Decision made by May 13th. Sitka Fine Arts Camp Scholarship. The winner of the 2015 scholarship to the Sitka Fine Arts Camp is Seward Middle School student Emmalee DeLand. The camp provides students with a two-week long experience exploring the Arts. This scholarship is offered by the Arts Council annually to one student through an application and selection process that is based on the applicants’ merits. Summer Scholarship. Scholarships will be a minimum of $50.00 each and are dependent upon the number of applicants. Scholarship recipients will receive notification of acceptance via e-mail, and scholarship money will be sent directly to the school, camp, or program--not to scholarship recipients. Summer scholarship deadline: May 5th.